TERT accessories are available for TERT related conferences. Shipping to your location will be free. The only cost to you will be the outgoing shipping you pay. Click Here for more details. I would start by saying it was a great deployment and a great learning experience in many aspects: to learn from how other centers operate and to be able to learn from those we were deployed with. Broome County Office of Emergency Services. My number at work is 9-1-1. You can reach me there every day of the week and every hour of the day. but when you call I will quickly get help on the way. Sometimes you may not be kind to me, but I understand. Something in your life has been turned upside down, and now I will gladly lend a hand. again, I understand, and I recognize the reasons why. I do the job I know so well, remembering all the details of every call. That’s what I do, I love this job, every minute, and the thrill of it all. What will the next call be, no one really knows. The lights are flashing on the phones, the officers are calling me too. And all the time I am thinking, this is what I love to do. The pace is fast, and now I am floating on a cloud. The faster it gets the more I smile. I hope this is going to last for a while. And then, unfortunately, it is time for me to go. With no questions about what I truly believe. A giver, not a taker, and yes, I do give a d’! As a Dispatcher, a Call Taker, I am truly proud to display. Thank you for reading this issue of the NJTI Newsletter. Please feel free to contact me with any comments or suggestions. The monthly Board Meeting of the National Joint TERT Initiative (NJTI) was held June 16, 2014 at 1:00PM Central Time. A conference call bridge was provided to NJTI Board Members and TERT State Coordinators who were unable to attend the meeting (at the NENA Conference in Nashville, TN) in person. During the meeting, I advised NJTI Board Members and TERT State Coordinators that I had accepted an offer from APCO 1st Vice President John Wright to assume the role of Chairman of the National Joint TERT Initiative, representing APCO. My appointment will be effective July 1, 2014. First and foremost, I’d like to begin by recognizing the efforts of my friend and colleague, Natalie Duran (FL). It was evident the day I met Natalie (during a TERT “Train the Trainer” class) in May 2012 in Alexandria, VA, that she had a passion for the initiative like no other. In the months that followed, Natalie provided valuable guidance to Director John Merklinger, ENP (New York State TERT Coordinator) and I as we worked on the continued development of the New York TERT (NY-TERT) program. The NY-TERT program now boasts an active membership of just under 300 TERT certified personnel, with a large number of the 62 counties of our state represented. Natalie would later ask me to join NJTI as a Board Member; an appointment I gladly accepted. Natalie’s commitment to the initiative extends far beyond her work as NJTI Chair for APCO. She (Natalie) travels around the country extensively providing TERT training to PSAP personnel seeking to participate in the program. Her work with the initiative will continue as an NJTI Board Member (APCO) and as a trainer for APCO International. Natalie’s leadership, guidance, and passion for the initiative are evident in everything she does. Thank you for your dedication Natalie. I’d also like to thank my boss, ECD Director and NJTI Board Member (NENA) John Merklinger, ENP (NY). Since appointing me to the position of Deputy TERT Coordinator for the State of New York in 2012, John has been committed to furthering the initiative in New York State. For many years, John was the only voice of TERT in the state. Only with his help and authorization did the TERT program grow as quickly as it did in New York; (a Tropical Storm and Hurricane in 2011 and Hurricane Sandy in 2012 helped our case as well). John, thank you for continuing to support my efforts (and the efforts of the initiative) at the local, state, and national level. Finally, I’d like to thank NJTI Chair for NENA Sherry Decker (TX). Sherry shares Natalie’s passion for the initiative and demonstrates a commitment to furthering our mission on multiple levels. Always willing to lend a helping hand or offer advice, Sherry is a ‘go-to’ person for NJTI. I look forward to working more closely with you in the weeks and months ahead. Thank you to those who’ve already reached out to offer words of encouragement. I know many of you share a passion for the initiative and are as eager as I am to get started. I’ll be counting on all of you to keep NJTI’s mission top of mind at the state and national level. In the end, this program is all about helping our brothers and sisters in the business when they need us the most. Establish a TERT program, through the development of an MOU with EMA, provide TERT training, recruit regional coordinators, establish a program database, manage TERT Personnel, conduct PSAP surveys, conduct threat assessments and create continuing education requirements. 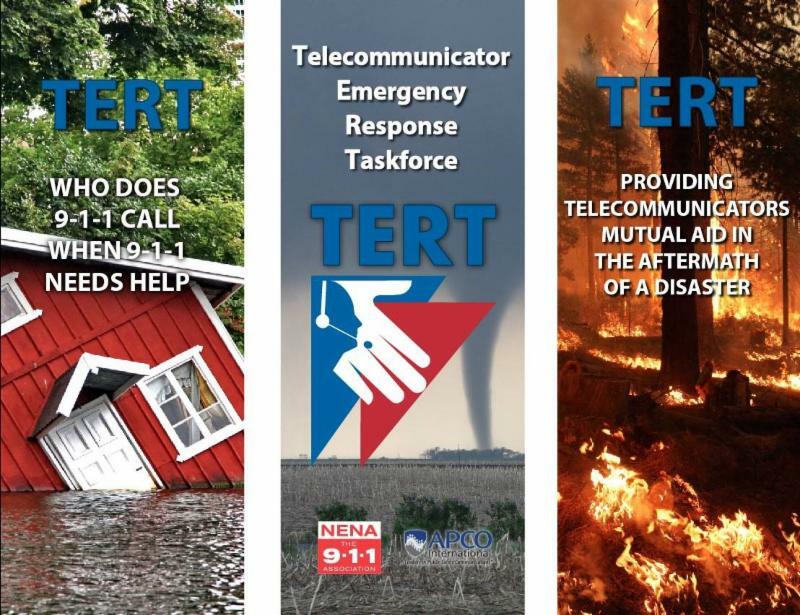 Prepare for TERT Deployment by developing a communications plan, maintain program contacts, build liaison-ship with EOC, disseminate program information, complete deployment records, maintain a TERT database, maintain NJTI deployment status and facilitate continuing education. Respond to TERT Requests by preparing for imminent deployment, fulfill ESF/EOC functions, deploy TERT teams, maintain contact with deployed teams, complete appropriate documentation and support CISM efforts. Recovery after TERT deployments by demobilizing TERT Team(s), offer CISM services, complete deployment records, conduct quality improvement review, and address lessons learned. Enhance professional competence by adopting TERT philosophy, participate in NJTI calls, engage in continuing education, read trade specific publications, attend training conferences and remain current on TERT issues. The project begins August 1, 2014 targeting one of the five development areas each month. This is a tight timeline with product turnover to APCO and NENA January 2015. You don’t have to be a state coordinator to volunteer, but you do have to be a champion for TERT. Join us and be a member of NJTI-TERT history! If we build it they will come! Conference calls will be each Wednesday at 10:00 a.m. Central Time Zone. Colorado just recieved deployment status! Click Here for Intergovernmental Agreement for Emergency Management. On May 28th NH TERT held the third annual Mobile Rally at NH Police Standards in Training. The event was well attended by NH TERT members as well as public safety personnel from New Hampshire, Maine, and Massachusetts. Approximately 30 local, state, and federal resources were available for participants to tour. The attending agencies also participated in an interoperability exercise during the rally. Lunch was donated by EXACOM and prepared by the Derry Salvation Army rehab canteen. The first minutes and hours of an incident are often the most critical. Setting the proper communication course, and then managing that course, are crucial when dealing with a WMD, terrorism, or all-hazards incident. Step 1. Verify the situation. The information that is disseminated by the media during the early stages of a WMD, terrorism, or all-hazards incident may be unintentionally slanted. The communication team must critically judge that information, attempt to reasonably verify the magnitude of the event, and seek additional information to put public/media interest regarding the event into perspective.